"Today we are bringing Shutterfly's industry-leading photo books to the four hundred million members of Facebook who currently lack an easy way to transform their photos into lasting memories," said Jeffrey Housenbold, president and chief executive officer of Shutterfly. "We've customized Shutterfly's award-winning photo books to fit the images and experiences people post on Facebook, ensuring that these photos have a life beyond the daily news feed." Shutterfly's online solution to creating photo books is neat because you don't need to download any software like some of the other vendors. 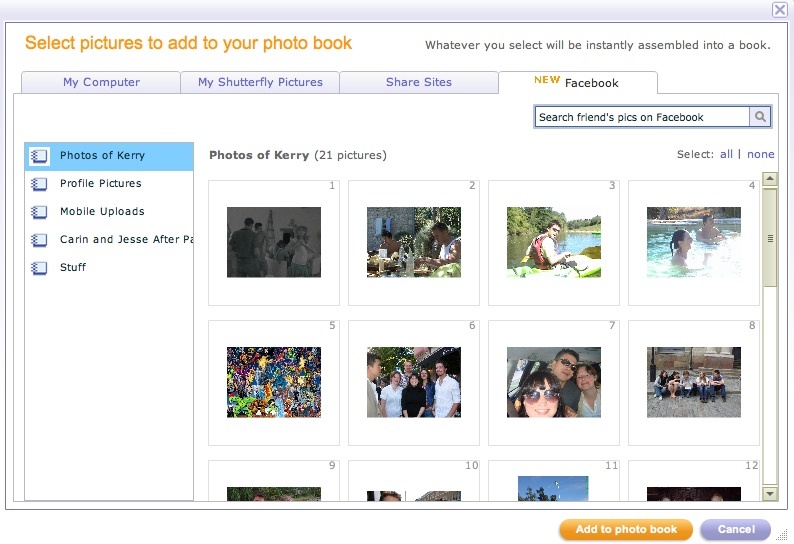 You can now pick and choose photos from your computer, Facebook, or photos you have previously uploaded to Shutterfly itself. The software also analyses the file size of your Facebook images and sizes / positions photos accordingly if you populate a book from one of your Facebook albums. You can also create a "Custom Path" photo book if you signup as a free member but if you're going down this route its worth looking at the alternatives as their online software is more limited in this area - such as bobbooks.co.uk (based in the UK but deliver worldwide). I prefer their Simple Path solution and I quite like the way you can position images quickly online without fuss and then batch upload the images at the end when you're ready to order. If you're interested to find out more visit shutterfly.com/photo-books/simple-path and let me know how you find it?